Wednesday, October 31, 2018 - Puddlecycle - Get Involved! Help us kick off Puddlecycle’s SIXTH year of winter rides! This group bicycle ride combines a spooky bike-in movie with a 6-mile ride to the Davis Graveyard. 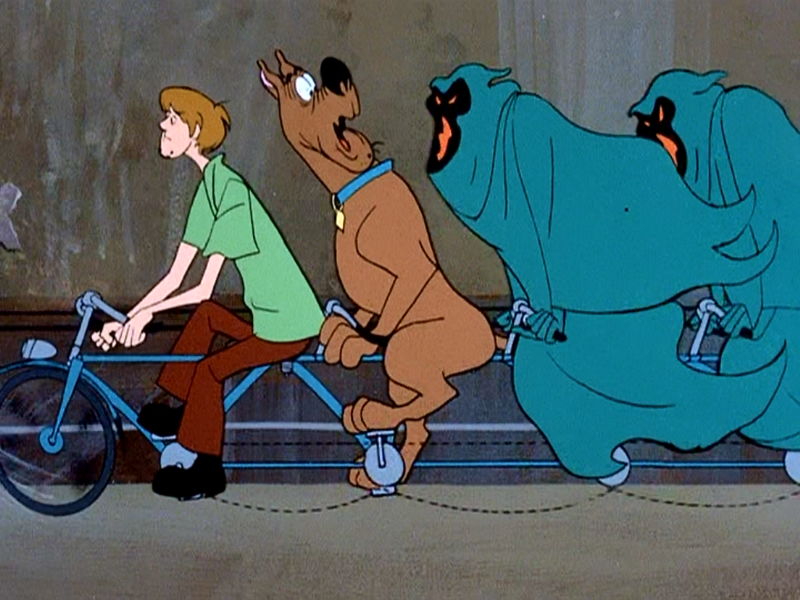 The bike-in movie is a classic 24-minute episode of Scooby Doo titled “A Night of Fright is No Delight” which features a bit of Shaggy and Scooby riding a 4-seat bike with a couple of surprise guests. Everyone who rides with us will get a bag of Keebler Scooby Snacks to munch on while watching the Scooby mystery. We’ll be projecting this underneath the McLoughlin Viaduct, so the viewing area will be dry even if it’s raining. Costumes and decorated bikes are encouraged – Scooby Doo theme optional! We will be riding past some Halloween houses in the Westmoreland area on the way to the Davis Graveyard. Meet: 7:00 p.m., under the viaduct at 499 SE Caruthers St.